This concept shown in Detroit will be the basis of the production-version LF-LC. LOS ANGELES -- The wild Lexus LF-LC coupe concept that wowed visitors at the Detroit auto show is on track for development, signaling a new direction for a brand that has fallen from first to third in the U.S. luxury sales rankings. Toyota is on a mission to make Lexus sportier and more compelling to potential buyers -- and it starts with the LF-LC, which was designed at Toyota's Calty studio in Newport Beach, Calif.
Company executives said in January that the flashy 2+2 sports coupe was not planned for production. But several Lexus insiders now say the overwhelming reaction means it almost certainly will come to market. Dealers could see the coupe in their showrooms within three years. Toyota registered the trademark for LF-LC in February, after the Detroit show. "There has been a lot of interest from dealers and distributors," a Lexus official said. The LFA V-10 supercar was a first step in the effort to give Lexus more flash, but only 500 are being built worldwide. Company insiders have said that a production version of the LF-LC would be more advanced technologically than the dowdy, heavy SC 430 coupe that was killed in 2010 -- more of an LFA "lite" than a traditional coupe. It also would be targeted further upscale, against the Porsche 911 Turbo and Aston Martin Vantage, both of which tickle the $120,000 mark. A laser rendering of the LF-LC sent to dealers is meant to spark enthusiasm. 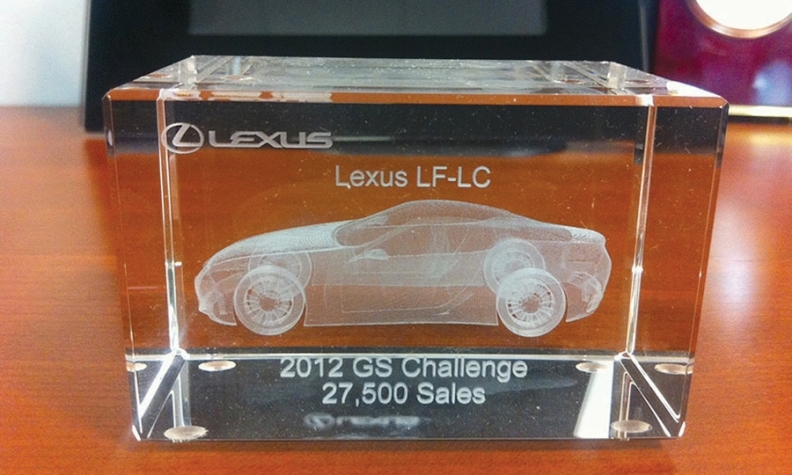 Lexus dealers recently were sent crystal sculptures with a 3-D laser rendering of the LF-LC etched inside the crystal. Inscribed on the crystal were the words, "2012 GS Challenge ... 27,500 Sales." The underlying message: Hit the sales target for the mid-sized sedan and get the cool coupe. 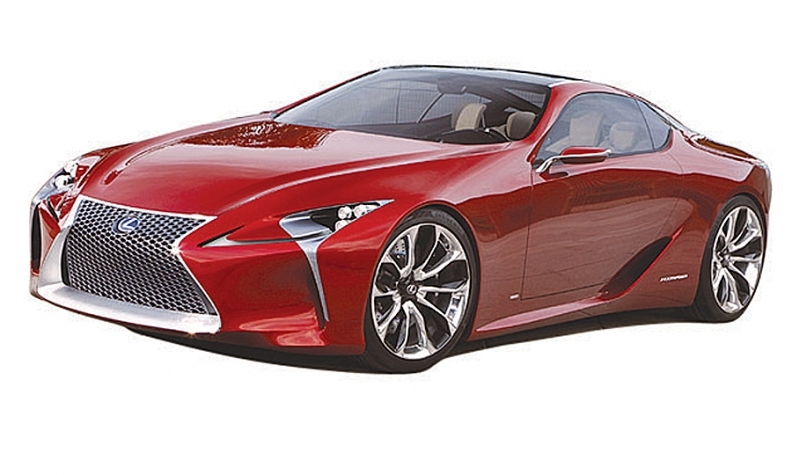 But the Lexus source said the LF-LC probably would be produced even if dealers don't hit the GS sales target. Lexus' 11-year reign as the best-selling luxury brand in the United States ended last year as it slipped behind BMW and Mercedes-Benz. Lexus continued to trail BMW and Mercedes in the first half of this year. The 2011 earthquake in Japan hurt sales by pinching production, but executives concede the brand's staid lineup needs to elicit more surprise and delight from buyers through styling and performance. Mark Templin, Lexus' global and U.S. chief, said recently: "In the past, we talked about the perfection of our product. But the 'Pursuit of Perfection' idea lacks emotion." While carrying the signature spindle grille of all Lexus vehicles, the LF-LC has swoopy, fluid lines similar to those of the exotic LFA. But with 2+2 seating and a hybrid powertrain, the LF-LC appears way more practical. Toyota can take up to 36 months to take a prototype to Job 1. Much depends on whether the new vehicle is derived from an existing chassis and component set. If Lexus uses the IS-F sedan platform, it could shave months off the development time. At the Detroit show, Toyota executives expressed enthusiasm for the car but said it was just a concept created to judge consumer reaction. The debut of the Acura NSX may have shocked Toyota executives into taking action. The LF-LC has since toured the auto show circuit and has appeared at the Concorso d'Eleganza Villa d'Este on Lake Como in Italy. Coupes typically are slow sellers after the initial excitement dies down. But Lexus may be willing to take the risk to inject some pizzazz into the brand. The previous-generation SC 430 peaked at 14,462 sales in 2002, its first full year of sales, before dropping sharply to half that in 2006. Volumes plummeted from there.